Simple banana bread recipe with 3 bananas and eggs is one of the most simple banana bread recipes even beginners can try. Banana bread can be enjoyed for breakfast or you can also enjoy this as a light dessert or a snack with a cup of coffee, tea or milk. This is also an easy banana loaf recipe since we use the loaf pan to make the quick banana bread. There are 105 calories in a banana which is medium sized, so since we are using 3 medium sized bananas, the calories from bananas alone will be 315. But the natural sweetness and calories in a banana is healthy and comes from the natural sources, so it is good source of healthy calories and sweetness. You may also use a cake pan to bake the banana bread if you wish, the results will be still good. The fruit based breads that we make using baking soda or baking powder is sometimes referred to as quick breads as we do not use yeast in such bread recipes (yeast recipes usually takes much longer). Even though this banana bread is an easy quick banana bread from scratch, it still takes the baking time of 45 minutes plus the time taken to make the bread batter and also the final cooling time. 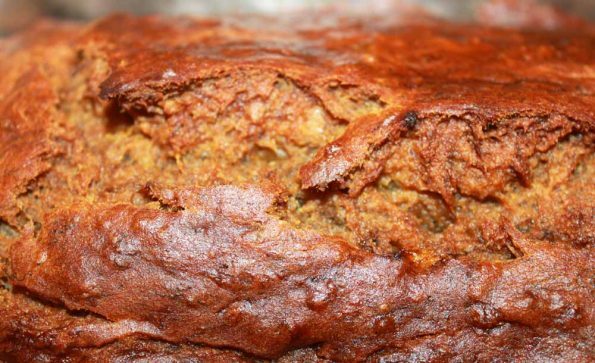 Banana breads are the most popular and easy quick breads you can make at home from scratch. Most of us usually end up with some overripe browned bananas on most weeks and the perfect solution for the overripe bananas is to make easy quick banana breads. This easy to make homemade banana breads are delicious and simple to make. You can easily make it if yo have ripe bananas and eggs and few other ingredients needed to make quick breads and cakes. This is actually very similar to a cake and you can even bake this in a cake pan, the only difference I see is that the banana bread is not as sweet as a banana cake as we use less sugar for bread recipes. You can easily make this at your home from scratch and slice them up to enjoy with your evening tea or coffee or with a cup of milk for kids. Banana bread recipes are many, with old fashioned banana bread recipes and many new recipes with so many variations. This is a very easy recipe for banana bread which is kind of a basic recipe which beginners can also try. Soft and moist, delicious, quick and easy – here is the best recipe for sweet banana bread that goes great as delicious snacks and also breakfast. 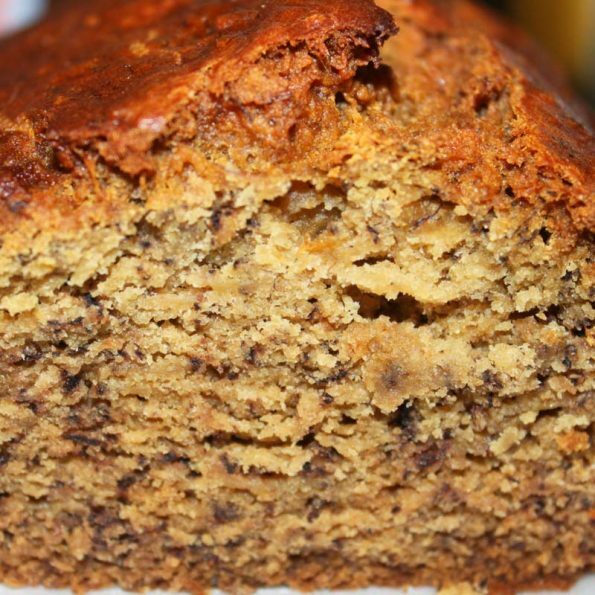 It is wonderful and totally awesome to have few pieces of this banana bread with the hot morning coffee. This recipe comes with a few ingredients, which is required to make a basic banana bread and so it is very easy to follow even if you are a beginner who learns baking. This quick banana bread is sweet, but most of it sweetness comes from the natural sweetness of ripe bananas. So it is important that you use very ripe bananas, you just have to make sure the fruits have got the brown spots on their yellow skins. The bread got baked in 45 minutes which is quite fast, but it actually depends on the oven you use. So if your bread is not cooked in 45 minutes, check after 50 minutes. In some ovens it may take even up to one hour. 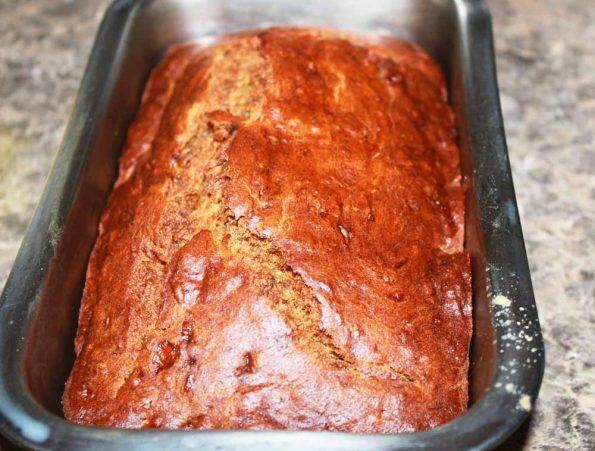 So here is how you can make this easy and simple banana bread following this simple banana bread recipe from scratch. Homemade banana bread from scratch is easy to make, simple and delicious too! Whisk the egg is a bowl. Add the sugar to the whisked egg and mix well and keep aside. Add the melted butter and vanilla extract to the egg sugar mixture and mix everything well. Mash the bananas in another bowl, little chunks of bananas are fine as they taste nice in the loaf. Add the butter, sugar egg mixture to the mashed bananas and mix well. In another bowl, mix together the remaining dry ingredients - flour, baking soda and salt. Make sure you have mixed the dry ingredients evenly. Pour the banana egg mixture ( that also contains melted butter and sugar) to the bowl of dry ingredients, and mix gently so that no lumps are formed.You don't have to mix too much, but mix everything together in the bowl very gently so that the perfect batter for banana bread is formed. Grease your baking pan, I used a 9 inch loaf pan, and pour the banana bread batter into it. Preheat the oven to 350 degree Fahrenheit and bake for 45 minutes. Check if the center of the loaf is cooked by inserting a toothpick to the center, if it comes out clean the bread is done! If not, cook for few more minutes and check in between to see if it is cooked. Slice and serve the warm banana bread with evening coffee, or you can make it in the night and save for the morning breakfast. 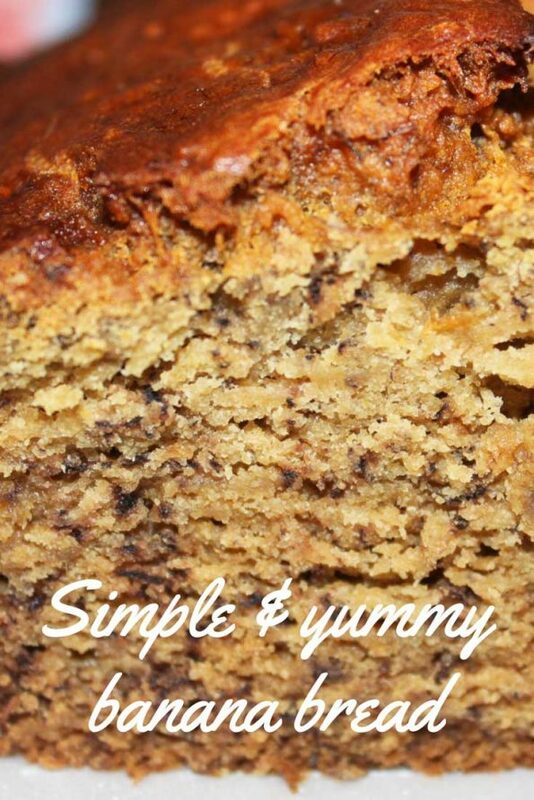 Hope you find this post on simple banana bread recipe helpful!